Cyclone Separators are manufactured in many different sizes. These cyclones provide an efficient and cost-effective means of separating particulates (material) from air in a pressure or vacuum pneumatic conveying airstream. Cyclones operate by generating a vortex of particulate laden air. Centrifugal force pushes the particulates toward the outer cyclone wall where they lose velocity and spiral downward to the discharge. The relatively particulate-free air is then exhausted through the clean air discharge port which is attached to the top of the cyclone. Efficiency of this process depends on the material being conveyed, material/air flow rates, and cyclone design. 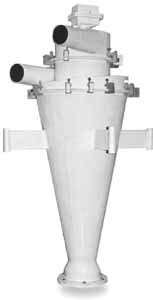 Typical applications for cyclones are at material processing points, such as sifter stations, pulverizers, and liquid mixers.